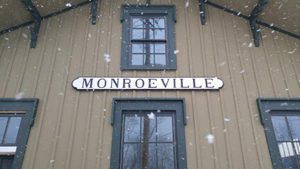 Donald E. Morrow Depot & Park – Firelands Rails to Trails, Inc. In the 1870’s, over 27,000 passengers a year passed through these doors as they boarded their trains! Built in 1863, this Toledo and Cleveland Railroad (later Lake Shore and Michigan Southern) depot is the oldest on the Norwalk Branch, and its exterior has been restored to its 1914 appearance as it served the New York Central. Named in honor of Donald E. Morrow, a successful local businessman and Korean War Veteran who preserved this treasure for so many years, the depot is now FRTTI Headquarters, the hub for all trail activities, and a Railroad Heritage Center. The Park property offers trail users a place to stop and relax, and includes a pergola and bench surrounded by showcase gardens. The Depot is open to the public on select weekend days throughout the spring, summer and fall, staffed by FRTTI volunteers. Check our Facebook events for a listing of depot open dates! Depot is OPEN today 11-1.